7 a day? No problem! So now we are being told that we should be eating at least 7 fruit and vegetables a day. A study by University College London has found that those eating at least 7 portions of fruit and vegetables a day were 42% less likely to die prematurely. Those eating 7 to 10 portions a day were 25% less at risk of death from cancer and 31% less likely to die from heart disease compared to those who just ate one. 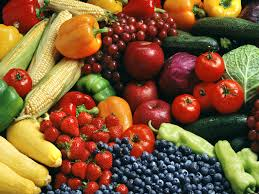 Basically both fruit and vegetables contain antioxidants which repair damage to cells, fibre needed for healthy digestion along with vitamins and minerals such as zinc, iron and vitamin C.
A typical 80g portion equates to a handful of veg or fruit or one large piece of fruit. Basically we all know that fruit and vegetables are good for us but how can we ensure we are getting enough and how can we incorporate them into our daily diets? Snack on a piece of fruit with a handful of unsalted raw nuts such as almonds or cashews. The protein in the nuts helps to slow the release of sugar from the fruit and will help you to feel more full. A midmorning snack and one in the afternoon and that’s 2 already! Add fruit to your breakfast. Apple puree or mashed banana in porridge, blueberries with muesli or even just a piece of grapefruit after your toast. Salad can be added to sandwiches or better yet take a salad to work. Mix rocket, baby spinach, feta cheese, olives, tomatoes and cucumber and add a lemon and olive oil dressing. Vegetable soups can be made in large batches and eaten during the week or frozen. Try carrot, sweet potato and butter bean or mixed vegetable lentil and barley. Vegetables can be hidden in tomato sauces for those fussier eaters. Try making a tomato sauce with pasatta, garlic, parsley, onion, courgettes and peppers and blend once cooked. Serve with pasta and salad.